LUCENA CITY – The Sangguniang Panglalawigan (SP) of Quezon balks in giving away 5,000 square meters of property for continued use by the DENR Ecosystem Research and Development Bureau at Bgy. Talipan, Pagbilao town. During its last regular session held on Friday, (Dec. 7) SP members led by its presiding officer, vice governor Sam Nantes, stopped short in approving to pass a resolution donating such property which was allegedly endorsed already by Gov. David ‘Jayjay’ Suarez to the SP. Gregorio Santos, Jr. head of the Ecosystem Research and Development Bureau of the Dept. of Environment and Natural Resources with a research station in Sition FORI, Bgy. Talipan was allowed to speak during the session to make his appeal for the property donation saying that such move would redound to the benefits of the province. Santos said that they would be building additional facilities in the area for laboratory for soil and water and for germinating test for seeds and that the area would be primarily used for biodiversity and research development for the interest of the province and the whole country. He said they have no ‘security of tenure’ in the area so they are asking permission to be able to pursue their environment services and research development. SP majority floor leader Isaias Ubana opposed for the outright donation of the property suggesting to offer option for the DENR use of the area. Ubana, SP committee chair on ways and means, said it would be better for Quezon to offer the use of usufruct to the DENR. Quezon 2nd district SP board member Ferdinand ‘Bong’ Talabong, the only lawyer of SP, said the deed of donation is a ‘sine qua non’ for the DENR to build its facilities, or they can have a contract of lease as he expressed his belief that the interest of Quezon will be upheld by the DENR mandate for environment protection and services. Talabong said that Santos may have already communicated with Gov. Suarez who has issued a directive to donate the property to the DENR as it would be good for the province. Provincial agriculturist Roberto Gajo whose new designation as acting provincial administrator was later unanimously approved by SP members, told them to study further the matter of donating the property for the clear benefit of the province. For his part, Nantes said he is looking for the short and long term effect of the decision regarding the beneficial interest of the province and so he requested that the matter be referred to the proper committees for further deliberation. After majority of the SP members agreed for such referral, they went on to approve the P322 million provincial government supplemental budget No. 3, the Sang. 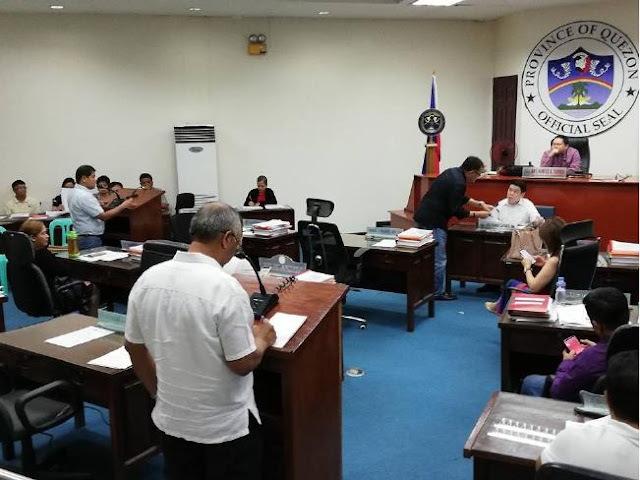 Bayan ordinance of Mulanay approving the P150 million Landbank loan, the provincial local youth development plan and referral of the various municipal budget ordinances for 2019 to the SP budget committee.